At first, I thought this card was the info sheet for the box. It wasn’t until I had finished the unboxing that this card is actually explaining the little wood piece, which is an actual lovespoon from the Welsh tradition! Each month, your subscription feeds 10 people through the Feeding Children Everywhere foundation. Also included is a gratitude card. I loved opening it and seeing such a sweet sentiment. How chic is the packaging on this candle? I am in love! This 8.5 oz candle has about 50 hours of burn time, and it burns clean thanks to the all-natural soy wax and cotton eco wicks. This smelled sugary sweet and reminded me of vanilla frosting, so it was a winner in my book. This also has a great scent throw, so it filled up my living room with the sweet scent. I love lavender scents, and this candle really brings the lavender—I am in love. 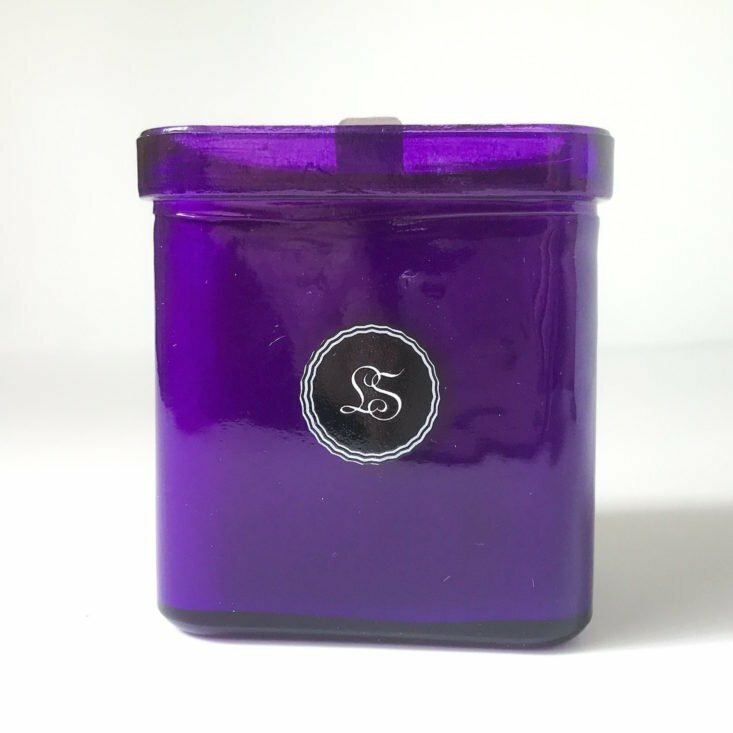 Even though this is styled differently than the vanilla candle, it has the same 50 hours of burn time with the clean-burning wick and all natural soy. Usually, lavender candles are mixed with other scents where they can be hidden, but really just lets the natural scent of the lavender shine. I am keeping this next to my bed to light for a while before I go to sleep at night! Though this candle is small, it is mighty! This 2 oz size is perfect for scenting my powder room, and I love that the small size and packaging means I can travel with it, too. I enjoy citrus scents, and this citrus mandarin scent is really quite lovely. This has about a 12 hour burn time. The Verdict: From start to finish this box wowed me—just the packaging and unboxing experience was spectacular, and I truly felt like I was unwrapping a gift. Luckily, not only are the candles beautiful but they also smell great, and they do a good job of filling the room when lit. I think this box would be an amazing gift, but this is also a great gift to yourself. Value wise, this box has a value of $62.95, which is a little over $10 more than the $44.95 cost of the box plus $6.95 shipping. Can you still get this box if you sign up today? Yes, order by the end of September to receive this same box! Check out more candle subscription boxes in the Artisan Subscription Box List! I’m jello!-sounds like those are some nice candles & unfortunately (outside of tax return season), this sub is out of my price range. I did enjoy vicariously “unboxing” it though! I’ve never heard the term “scent throw” before, but now I know this is a quality I want from all candles. Thanks for your detailed review. I love knowing that these can smell up a room. I hate it when I buy a candle that smells great in the jar, but gives zero scent throw when I take it home and light it. Exactly why I stopped buying Bath & Body Work candles after they parted ways with Slatkin & Co. NO scent throw. What good is a candle that doesn’t smell good all over the house. I don’t want to be sticking my nose in the flame to get a good whiff.